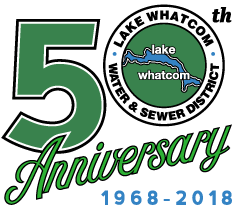 Lake Whatcom Water and Sewer District provides water service to approximately 3,633 residential customers and sewer service to approximately 3,883 residential customers in an 18 square mile area encompassing Lake Whatcom. The District is operated by 18 full time staff persons, a five-member Board of Commissioners, and has an annual operations and maintenance budget of about $5 million dollars. To find out if your address is in the District, enter it below and press search.